As cited by the American Trucking Associations’ report, woman are an underutilized segment of potential drivers. “Females make up 47% of all U.S. workers, yet only comprise 6% of all truck drivers...and the share of female drivers has remained stagnant between 4.5% and 6% since 2000." So what can trucking companies do to one, attract and retain female drivers? That answer can be boiled down to transparent, sincere marketing. Most traditional marketing is geared towards male drivers. If you stop at any truck stop or gas station, all you see are the same stock photos of mostly men in front of their truck with a simple tagline about two generic benefits. We've seen them all - "Competitive Pay, and More Time Home." These terms are everywhere. At this point, these "benefits" should be "I should hope so" features. Yet why aren't these print ads catered to women as well? If there is any hope at attracting female drivers, it'd be a good idea to actually feature women drivers in the ads displayed, especially because they represent nearly half of the workforce! Ideas like pivoting the message, images and marketing vehicles to deliver the content can all help this theme, and including women in the ads shows that you’re serious about committing to a female friendly driving environment. Werner's ad doesn't talk about pay or employee benefits. It simply evokes an emotional response geared to women in trucking. It’s worth analyzing where you found your current women drivers and if they came from the same sources as traditional marketing vehicles. Use our example driver persona template to carve out a few female driver personas that you can gear messaging towards. As noted in the list above, female drivers are dissatisfied with their job because their experience didn't match the expectations when signing up. So as you're crafting your ads targeting women drivers, make sure that what you're saying will hold true. The last thing you need is to hire another driver only to have them out the door in a year because you couldn't stick to your word about he advantages to working for your company. Think about what really makes your company a great place to work, and don't just list them in bullet point fashion on a 11x17 poster. 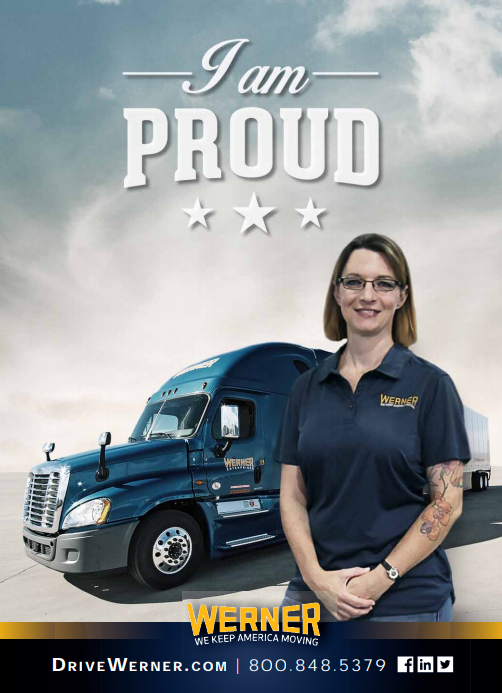 Be proud of what your trucking company has built and invite other drivers (especially women) to be a part of the action. Everyone is looking for a silver bullet to the driver problem. This is not it and there is not one answer out there. But, women are an under-served market and they are inherently more risk adverse (great added benefit!). Just like carriers have created special campaigns to hire veterans, the industry should be thinking the same way about increasing the population of females in their fleet. An underused 47% of the workforce is great place to start putting more effort as one piece to solving your driver problem.